Silver is a new magazine for discerning, fearless fiftyplus readers who have a love of life and a touch of punk close to their hearts. We know you don’t feel old. So why don’t you have a decent magazine that fits your lifestyle? You sowed your wild oats through the 1960s, ’70s and ’80s. There isn’t much you haven’t seen, right? You’re traveling, launching new businesses, taking risks, buying property, changing direction – even throwing yourselves out of planes. You’re not pottering around in a cardie, are you? Well, not all the time. Silver is a magazine reflects the real 50+ generation, with all its fire and fun – and future. Silver is going to push some buttons. This isn’t a magazine filled with Aga recipes and tips for retirement gardening. 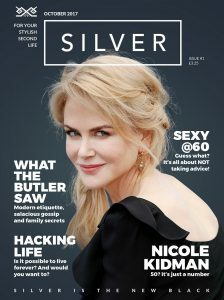 Silver has challenging editorial features, including interviews and hard hitting articles, and covers all your interests from amazing food, fashion and fitness, to travel, business, and music. Cover price for Silver Magazine is £3.25 but right now you can subscribe for your first copy completely free HERE.